Born a Roman Catholic with Jesuit relatives, Donne did not go abroad to Douai to study, as was typical of English Roman Catholics of his time. Instead, he studied at Hart Hall, Oxford, and Trinity College, Cambridge. Afterward he studied law at Lincoln's Inn, London. He joined the staff of the Lord Chancellor, but eloped with his niece, Anne More, in 1601. Their marriage resulted in Donne losing his livelihood and being thrown into prison. Donne was known to the king, however, and after failing to secure a position in other fields of endeavor, he acceded to the king's desire that he enter the ordained ministry. He became Dean of St. Paul's Cathedral in London six years later. Donne is the first and greatest of the group known as the Metaphysical Poets. 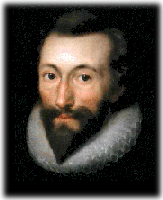 His Songs and sonnets and Elegies are variations on the theme of love, but they are not typical Elizabethan love-poems. They contain a suprising breadth in the range of human experience they describe, and in the spiritual imagery they employ. Donne's Divine Poems are marked by unsurpassed passion, and much of his poetry explores the paradox of sexual experience in the religious and spiritual force in earthly passions. His religious poetry is grounded in a deep sense of sin and the awareness of judgement. As T. S. Eliot has written, he "was much possessed by death," and some of his most powerful sermons vividly illustrate Donne's almost medieval awareness of the universality of dissolution: "Ask not for whom the bell tolls; it tolls for thee." The Anglican Library, copyright 2000.